It is menu time again, do you have your menu planned yet for the week? Do you know that by planning your menu you save time, money, and frustration? 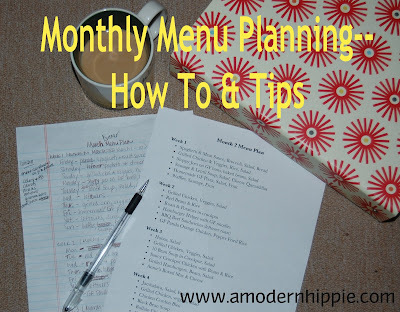 Menu planning is not fun (well maybe it is for someone), but it is WORTH the time & effort. When you have a plan for eating you do not have to put much thought into what you will have for dinner. I used to hate coming home from work and trying to figure out what to make when I did not have a menu planned. Taking some time to plan will save you from being frustrated so you don't stand in your kitchen wondering what you will make for your family. It also saves you money because if you have things planned and the groceries purchased for that plan you are less likely to order in pizza! Also, if you are constantly going to the store to buy a few items here and there for meals you will spend ALOT more on groceries then if you have a set plan. Curious what my process is to plan the menu? 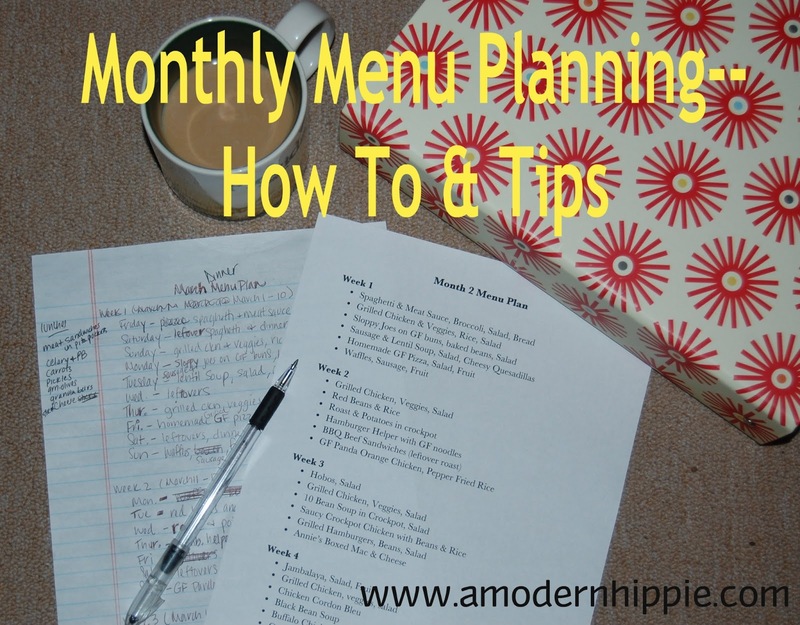 I hope, because I'm going to share with you my process of getting a month long menu planned and some tips that will help you get more organized in your menu planning. Over the last few years I have changed how I go about planning menus. I used to plan a week at a time and grocery shop over the weekend, but I hate doing those kinds of things on the weekend when I would rather be hangin' out with B and going on fun errands like purse shopping! I am currently not working, but will be as soon as we move back to KS (I hope!). So in preparation I'm in the process of creating rotating monthly menus to make my life easier transitioning back into full time work. I have 2 months planned so far, and by next month I will have 3 months of menus. At that point the hard part is done, I will have 3 months of menus that I can rotate. It takes me a couple of hours to plan 1 month of meals, but then I'm done for the month and only have to think about it when I make my list for the grocery store. You may be thinking, "well that might get boring if you never add any new meals to the plan." I thought the same thing, but that is not a huge issue. All I have to do prior to the next months menu rotation is look and see if I want to swap out a few meals on the rotation for a few new recipes. Trust me, I will be doing this because I always have new recipes I want to try. 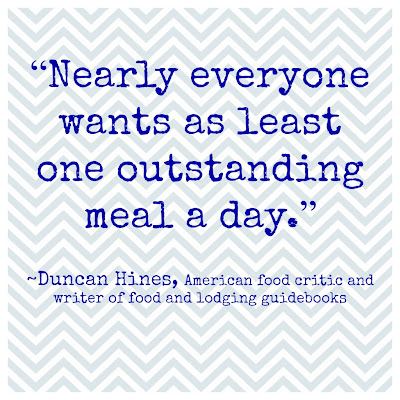 In reality, swapping out a few meals on a monthly rotation should only take you 5-10 minutes. Now that I have a menu plan figured out it is time to make the shopping list and do the dreaded task of grocery shopping. I only buy groceries one week at a time. I chose to shop weekly because the majority of our groceries is produce. I buy very little boxed and canned foods, which makes shopping fast because I only shop the perimeter of the store! Every family and budget is different, so this might not work for you, but you can find something that works. 1. I sit down with my recipe binder, cookbooks, computer, and make sure to have your favorite beverage so you can sip on it while you work. Do not pull out ALL of your cookbooks, as this will be to overwhelming. I usually pull out different ones each month for variety. I mention my computer because I bookmark ALOT of recipes I find online. Online recipe searching is a great idea if you do not have access to many recipes or cookbooks. Some great sites I use to find recipes are: SkinnyTaste, Food Network, Foodgawker, and of course Pinterest. 2. Get a calendar to reference as your planning for the month. Remember to note any special events or holidays that might have an impact on your plan. For instance, my birthday is this week so we will probably splurge this week and eat out twice, because I don't think you should have to cook on your birthday! 3. On a notebook I start with week 1 and jot down the days of the week. I look through my recipe binder, cookbooks, and online, writing down meals for week 1. At this stage I plan meals with each day written down during the week (Sunday-Saturday) so I make sure I plan enough meals and do not plan meals on days I know we will have other plans. Continue until your month is planned. 4. I always have at least 1 day for leftovers and 1 day to eat out. So technically I'm planning 5 meals for 1 week. Some weeks I will have two leftover days, depending on what I have planned that week. Since it is only the two of us eating, we usually always have leftovers from each meal and can manage with 2 leftover meals a week, which really helps the budget! 5. I only plan dinners for a month at a time. Breakfast and lunch I plan as I make my shopping list each week. 6. Once the month is planned I type the month's menu in a word document so it is nice and pretty. I mentioned above that when I'm planning the menu I jot down each day of the week. When I'm typing up the monthly menu I leave the days of the week off, so I just have a list of 4-5 meals (usually) listed under each week of the month. Make sense? 7. Before I hang it on the fridge I make my grocery list for the week, remembering to plan for breakfasts, lunches, and snacks. Planning breakfast and lunch is quick to do on a weekly basis, as we usually eat the same kind of things for these meals--smoothies, eggs, oatmeal, salads and wraps. I don't worry too much about snacks, as I always have nuts, fruits, and veggies around the house. I also have a few really good larabar recipes and a raw cookie dough ball that are great for snacks. 1. Have a grocery budget. I am starting a series next week on budgeting & getting out of debt, so I will talk more about this in the next few weeks. If you do not have a budget for groceries I highly encourage you to set one. I have a set amount of grocery money each month and when I'm out we are done buying groceries that month. This really helps me plan menus that I know can fall within that budget. 2. Determine how you will plan your menu. Every family is different, so maybe you can only plan a week at a time or even a few days at a time. Don't feel like you have to do what others are doing, figure out what works for you. 3. 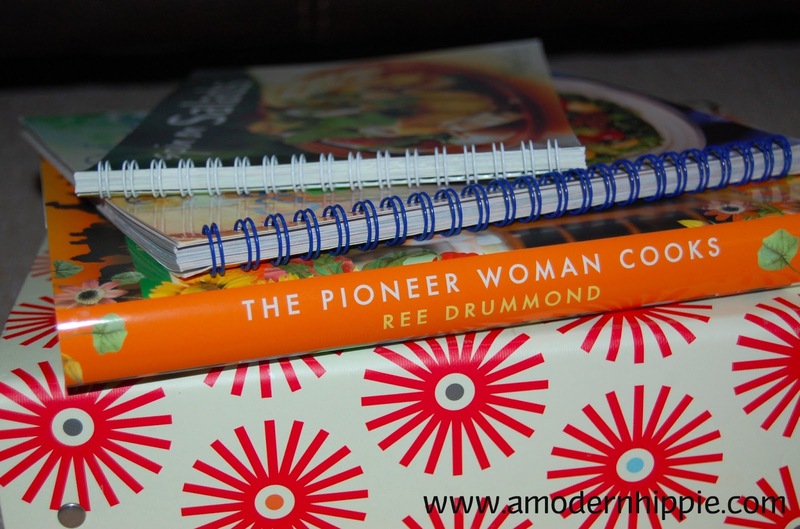 Surround yourself with great cookbooks and recipes. I LOVE looking through recipe books with gorgeous pictures. I hate to say it, but I wont buy a cookbook that does not have good quality photos of each recipe. You can say it, "I'm a food snob." 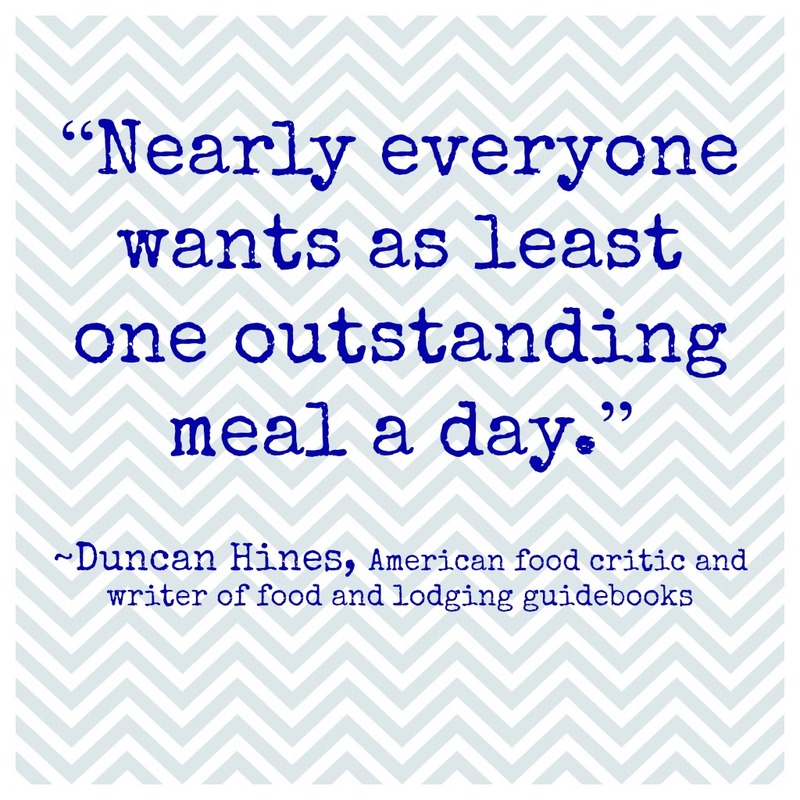 Remember when you look for recipes or cookbooks to be realistic with what you can handle. I love cookbooks with fancy recipes, but I don't have the budget or the time for those recipes so I usually do not purchase fancy/high maintenance recipe books. As I mentioned above, finding recipes online is another excellent resource. 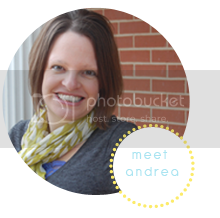 I will be sharing with you later this month about how I organize my online recipes. 4. Know what is in your pantry & freezer. You don't need to have some fancy inventory for this, just keep in mind what you already have that you could use in your meals. This also helps keep your grocery budget low! I always check out the pantry and freezer before sitting down to plan so I know what I have to work with the next month. 5. Don't take your hubby grocery shopping. Ok, this one might just be for me because when B goes to the store with me he always buys things not on my list. And usually it is junk food which throws our budget off! Am I the only one that has to leave hubby at home when grocery shopping? Do you meal plan? If so, I would love to know how you do your menu plans. What are you eating this week? Great tips!! I love monthly meal planning. Thanks for linking up with What's for Dinner! You are so organized! I love your tips. Thanks for linking up!